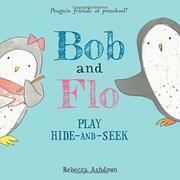 Those lovable, naïve preschool penguins are back, this time learning the basics of hide-and-seek. Bob’s umbrella on a rainy morning is the inspiration: “Oh, hello!” say Flo and Sam. “We didn’t see you hiding under there!” But despite this broad strategic hint, Bob, true to form, remains clueless as they play. While Flo and Sam count to 20 (rather, to 10 twice, as “counting to twenty is hard”), Bob “hides” in plain sight. Sam gives further direction: “You have to hide behind something.” But the play frying pan held in front of his face is still too revealing. Flo says, “You have to disappear.” This time, Sam and Flo give Bob plenty of time to hide, making a pretend cake in the kitchen corner. Meanwhile, Bob has finally gotten it. The question is, will young readers? Bob has fashioned a life-size pixelated penguin out of yellowish, orange, and black blocks. He stumps Flo and Sam, who don’t see him peeking out from behind his creation. After praise all around, for good hiding and a good cake, the tale abruptly ends. The tongue-in-cheek humor that made Bob and Flo’s first outing (Bob and Flo, 2015) so much fun is missing here, though the droll, expressionless penguins are comical. Children may yell out directions to Bob, but this is not as overtly interactive as books that ask questions directly of readers.